1. Bring your own hand towel or hand sanitizer with you. Most public restrooms don’t feature paper towels or hand dryers, as all locals carry little hand towels with them everywhere to save paper, energy and reduce trash. Luckily Jess had hand wipes for us to use!! 2. All restrooms feature squatter toilets. While in newer buildings and more modern spaces like train stations, airports, museums and restaurants feature Western-style toilets these days, many also feature squatter toilets. Apparently they’re very common all over Japan, China and Middle Eastern countries – they look exactly like they sound. It’s basically a toilet in the ground that you squat over. Squatter toilets are even more common in rural areas, and at parks and places with older facilities that may be the only kind of toilet you find! Most of the Japanese people we saw were perfectly comfortable using those toilets, but we definitely didn’t. We just went on searching for another toilet if a place we visited only had squatters! Just keep this in mind if you plan to go on day trips outside the city to somewhere more rural. 3. There are almost zero trash cans on the street. Occasionally you’ll find them next to vending machines and at train stations, but there were days Jessica and I had to carry around our trash and empty water bottles for a few hours until we found them! 4. Have the Japanese translation for your addresses if you plan to use local taxis. Not a single one we hailed was able to look at the map on our phones and figure out where we were going, only because the street names are in English! Luckily, I had read about this prior to our trip and had the Japanese characters listed under each address written in English. Tokyo has Uber, so we used that pretty often, but in Kyoto we either walked or had to get a taxi! 5. Make your dinner reservations for your entire trip the second you arrive in Japan. The restaurants are all very, very small and seat a very limited number of people at a time. We had to change our dinner plans a few times last minute because the places we wanted to go to were booked and weren’t taking walk-ins. Even if you just call to reserve earlier that day, you are more likely to get a table than if you just show up. 6. Wear socks (or bring them). Not only to prevent blisters, but a lot of places at temples, shrines and even some restaurants require you to remove your shoes before entering! 7. Taxis from Narita airport into Tokyo are incredibly expensive. If your flight doesn’t land super late at night, I would recommend taking the train instead. I think we ended up paying nearly $250 USD for our taxi when we landed in Japan! The train takes about 30-45 minutes more than a taxi would, and it’s a fraction of the price. The only thing you have to worry about is lugging around all of your bags! Shinkansen: the Shinkansen is a high-speed (bullet) train that is a great option for longer distances. We took the bullet train when traveling from Tokyo to Kyoto (and back), and also to Hiroshima from Kyoto. The Shinkansen is way more expensive when compared to JR lines, but you’re guaranteed a seat, there’s room for your luggage, there are clean bathrooms and there’s a snack/drink service. They also make announcements for stops in English, which is a nice bonus! Japan Rail: this is the most inexpensive way to get around the city. 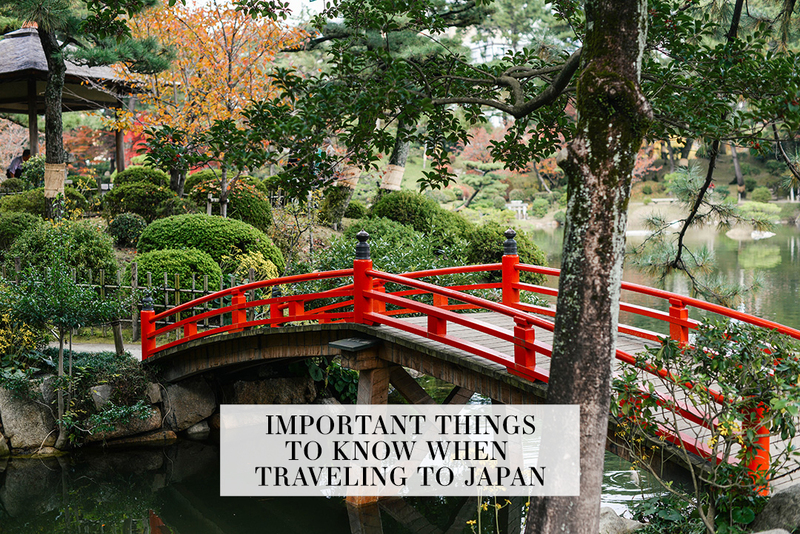 It’s a great option if the day trips you are planning aren’t very far (like Arashiyama from Kyoto or Nikko from Tokyo – about 40 minutes). They make quite a few stops because it is a regular local train, but they’re pretty efficient and an easy way to get around both in and out of the city. Since we ended up taking Uber, taxis or walking nearly everywhere, we didn’t end up needing one, but if you plan to avoid taxis and just use public transportation, I would recommend buying a Japan Rail Pass for the days you are there. There are stops every few blocks all over the city, which makes it incredibly easy to get around! 9. Pre-order a pocket Wifi device to pick up when you land at Narita Airport. Luckily I’d read somewhere that nearly nowhere in Japan has free wifi and learned about pocket WiFi systems while doing some research for this trip. Having pocket WiFi saved us on countless occasions: when looking for directions, finding restaurants in the area we were in, and of course it allowed us to post to Instagram and SnapChat in real time. I’ve had SnapChats get erased when I don’t have access to WiFi, so I was so glad we had this! All you need to do is pre-order the device here and select the day and time you plan to pick it up, along with the date and time you plan to return it on your flight out. It really is hassle free! I believe I chose the unlimited option and paid $150 for a total of 10 days. Yes, it’s a bit of an investment, but like I said… totally worth it!!! Great tips, Merritt. These will really help those who haven’t traveled abroad to Asia and such much. Agree – not a fan of squatting toilets. Eek. Sounds like you were quite well prepared…these are great tips! Japan must be an amazing place. I didn’t know about the squatter toilets before. Question about the pocket wifi – did you each need your own? Or are multiple people able to share one? No, we just needed one! I’m not sure how many people can share, but with just two of us we were fine!